I’ve been working on my egg poaching skills. It’s not going well. I am getting a lot of ghostly looking strands of egg whites in the water. I have read many online sources with tips and tricks and don’t currently have a favorite. Why am I poaching eggs? I happen to really like eggs and find them to be a perfect ingredient for many quick weeknight suppers. Beyond the traditional Eggs Benedict, you can pretty much top anything with a poached egg! A local diner favorite of mine is a vegetable hash – a big pile of roasted veggies – topped with a poached egg. 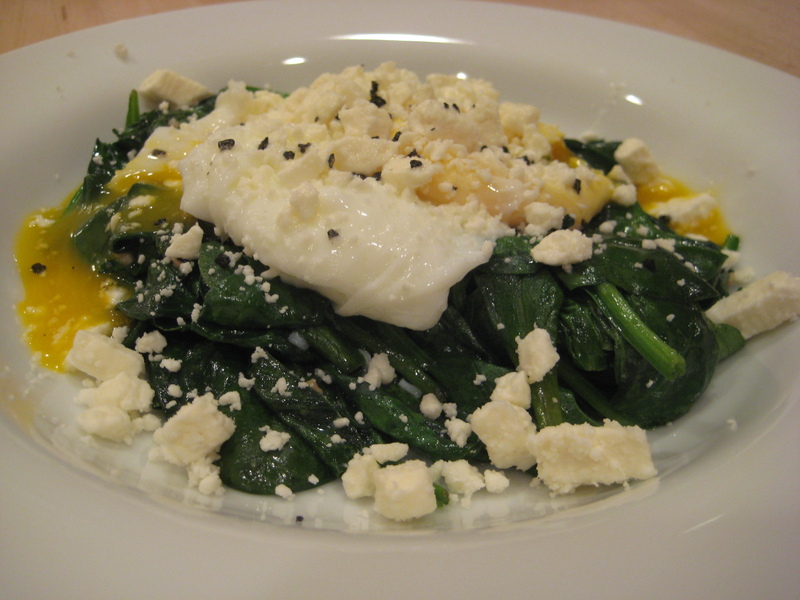 The other night I needed to use up some baby spinach too wilted for a crisp salad and I sautéed it with garlic and EVOO, topped it with a poached egg and some feta, sprinkled with some black salt and it was delicious! Looking forward to hearing others’ favorite poached egg recipes.